If you’ve followed the previous article, you now have a working ulogd2 installation.We will now explore the way data are stored in the database, and the default SQL schema provided with ulogd2. So, we have succeeded into transforming a fast and single (and simple) query into something slower and more complex, great. But why ? The SQL schema can be specific to the database used, and use the specific data types. For ex., PostgreSQL provides native support for IP and MAC addresses (using the inet and macaddr types) while MySQL does not, so we used binary types. SQL schema is easy to extend for specific needs or applications: you just need to add a new table, linked to the main table using the unique ID of the packet. This won’t affect ulogd2. Retrieving data is also easier for applications (like NuLog, since the schema is hidden behind views (or stored procedures). Unlike the first version of ulogd, the default SQL schema provided with ulogd2 splits the data from the packets into several tables, each table containing data for a protocol. There are tables for IP (common fields for all packets), TCP, UDP, ICMP, ICMPv6, and since recently, SCTP. MAC addresses are also stored in a different table. The provides a “cleaner” SQL schema than the “all-in-one-table” from the previous version, but at the cost of performance: each new packet will cause several insertions into different tables, and retrieving data will require to fetch data from several tables (using JOINs).This is, however, better space-efficient, since less data are stored (for ex, the MAC address is stored only once, and identified by a unique ID in the main table). This schema should be used when your insertion rate is not too high (you are not CPU-bound). The default schema will work for most installations. However, if you have are logging data on a fast link, you may have performance problems. 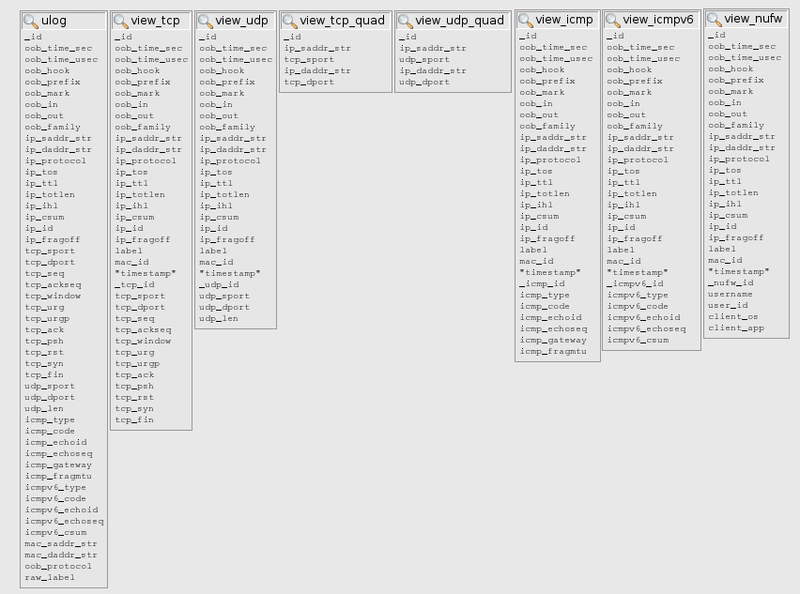 Assuming the problems come from the CPU, one solution is to change the SQL schema to a flat one (all in one table). 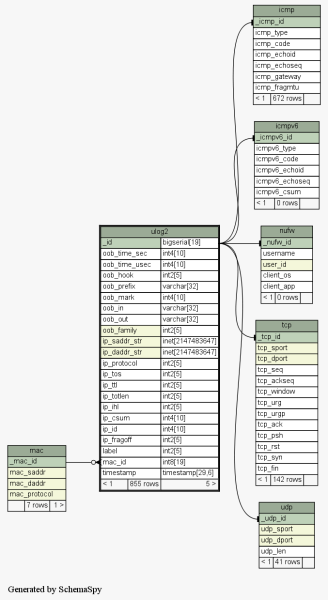 The flat schema is not yet written, but will shortly be submitted to ulogd2. Currently supported databases are MySQL and PostgreSQL. sqlite does not work, since it does not support stored procedures. I have also recently submitted a new output plugin using the libdbi database abstraction layer, which brings support for Firebird, FreeTDS (MS-SQL and Sybase), Ingres, and Oracle. It also supports MySQL and PostgreSQL, but there are specific plugins for those 2. The DBI plugin is not designed to replace all other plugins, since it can’t use the DB-specific API, for ex the asynchronous API for PostgreSQL. This article explains how to build, install and configure ulogd 2 for use with netfilter/iptables. It explains how to use plugins to store logs in databases (MySQL and PostgreSQL), use plugins to filter data, and gives some iptables rules to log packets. You will have to choose the input and output plugins according to your setup. NFLOG is present in recent kernels (and iptables installation), and should be preferred if possible. A stack must have only one source, and one output (yet it can have several filters). It is possible to define several stacks in the configuration. Each plugin has a type (for ex, PGSQL), and must be instanciated (using a name chosen by the user). Each instance is a particular version of the plugin, defining parameters. This way, we will be able to output data in several formats using different stacks. Check out the full list of features at the PostgreSQL site or download it from the download section of their site. As usuel, you can also find many things in the very nice documentation, one of the best I’ve ever seen.